This early short from Lumière demonstrates the conditions at London zoos at the turn of the century, and also serves as an early nature documentary. 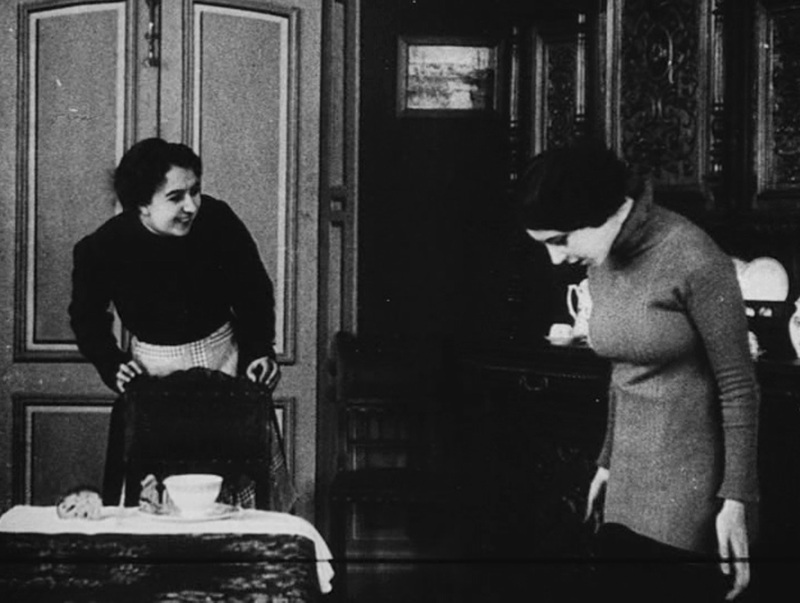 It is one of the “location” movies that the Lumière brothers made by sending men with cameras all over Europe and the world. A male lion is shown in a cage at quite close range, while a zoo attendant tosses small pieces of meat into the cage. The lion eats them, but also takes occasional swipes at the attendant’s hand when he is too slow to toss fresh pieces inside. The attendant moves around the cage, trying to find a better position from which to toss, but has to move back when the lion follows him out of camera range. The small lion cage will probably upset animal lovers today. It reminds me of the cages that big cats were kept in at the Central Park Zoo when I was a child, though happily that zoo has become more humane in recent years. I suspect that the zoo worker would have preferred to stand at a better distance from the cat’s claws, but for the purposes of the film he needed to be close. The animal is quite impressive and large, and looks like he could take the worker’s arm off if he wanted to. I also imagine that the small pieces of meat were a convention of the movie – surely you would usually give an animal this size something more to chew on. 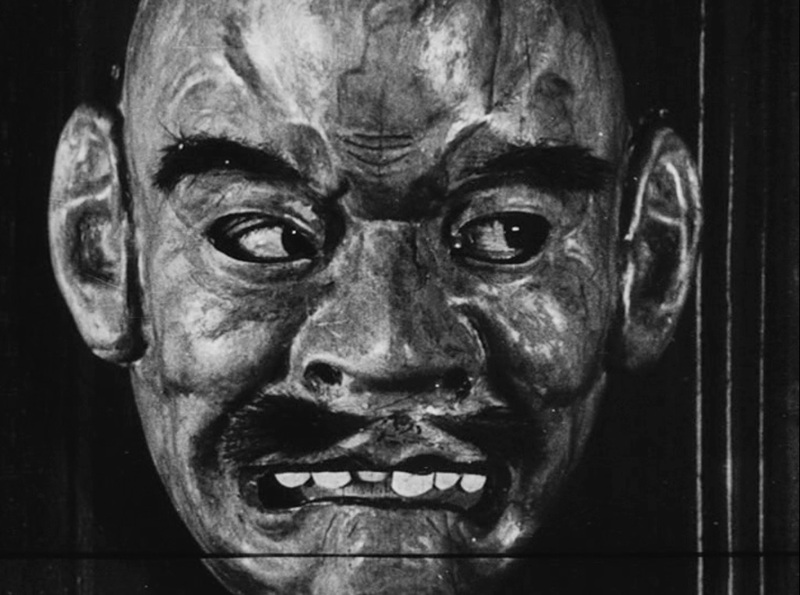 This short film stars Lon Chaney early in his career, and even shows of a little of his talents with makeup, for which he would later become famous. I was able to attend a rare screening at Cinecon, and so can now review the film, long thought lost and rediscovered in 2008. Note, as always in these cases, that the plot summary is based on my memory of a single viewing, and may be flawed. The movie is a metaphorical statement on human relationships, using cavemen to represent the instinctive drives. It opens by showing a classic love-triangle in caveman form. Lon Chaney is “The Lion,” a brute who shoos off “the Lamb” (Gus Inglis) and claims “the Woman” (Pauline Bush) by brute force. Now, a new character, named “the Fox” (Millard K. Wilson) sneaks through the bushes and fires an arrow from a bow, killing the Lion, and claiming the woman for himself. This is followed by a transition to modern times. It begins by establishing Chaney once again as the Lion, showing him in a brawl with another man, winning by brute force. At the riverside, we see a sequence in which the modern Lion takes the Woman away from the Lamb through force and the Fox attempts to defeat the Lion through ingenuity (this time setting a trap by attaching a string to a rifle). During this, there are superimposed images of the cavemen characters to drive home the point. When the Lion fails to trip the trap, the Fox runs away with the Lion in pursuit, leaving the Woman (who seems rather relieved) to her own devices. She takes off her stockings and begins to wade into the water, but accidentally drops one. She tries to reach it before it floats away, and winds up falling into the river herself. Now we see the Man (William C. Dowlan), who is fishing downstream. He feels a tug at his line and reels it in, discovering the stocking. Now the Woman appears behind the rock he is sitting on, and she tries to stealthily swipe the stocking, but the Man sees her. They playfully flirt and leave together. The final sequence shows the outcome of the various paths. The Lamb, now an elderly minister, sits among a group of spinsters sipping tea. The Fox and the Lion are together, living in poverty with a very ugly Indian woman (with a mustache) as their mutual companion. The Man and the Woman live in middle-class wedded bliss, their child running about happily as another minister comes over to visit. Lon Chaney, sans makeup, in 1919. This was a pretty basic little movie, rather simple for 1914, but interesting in terms of effects and the ambition of the storytelling. Essentially, it appears to argue that where brute strength and cunning were enough in the struggle for survival in “nature,” civilization benefits the person capable of empathy and understanding. It seems to me that this case would have been stronger if the Man had jumped in to save the Woman from drowning, especially if it was made clear that none of the other characters would risk their lives for her, but possibly this was beyond the capacity (or budget) of the filmmakers, or maybe I’m reading it wrong somehow. Chaney is impressive in his makeup (the woman presenting the next film commented “Wow, who knew Lon Chaney was so buff?”), and I wouldn’t be surprised if he also made up the other actors in their caveman and aged appearances (and maybe drew the mustache on the Indian). The use of multiple exposures to remind the audience of the caveman metaphor is typical of the period, but works well. Very little of Chaney’s work from the 1910s survives today, which is one reason we’ve only seen him once before on this blog, even though he was working from at least 1914 on and made over 100 films before 1920. Most of these movies are lost, and this one was thought lost until recently, when it was discovered in the UK and sent to the Museum of Modern Art for duplication, and it was their print that I was able to see at Cinecon, apparently in the first audience to view the film for over 100 years. This is largely to the credit of Jon Mirsalis, who many of us know as an accompanist to silent movies and is also a collector and preservationist in his own right. I hope that the day will come when everyone can see it, along with the rest of our public domain film heritage, freely and easily from home. This movie is not yet available on the Internet. The star power of Mary Pickford is teamed with the directing power of Cecil B. DeMille to produce a war propaganda picture just as the United States prepares to send its first troops to France to fight in World War One. The movie pulls no punches in showing audiences what the USA will be fighting for, but it has a reputation for being clumsy and jingoistic today. The final episode of “Judex” lives up to its title by being more about love and forgiveness than about crime and revenge. It serves almost as more of an epilogue than a discreet chapter of the serial. The movie begins at the seaside villa which has served as Judex’s headquarters for the final parts of the story. Judex (René Cresté) and his brother (Édouard Mathé) lead Favraux (Louis Leubas) into a room and put him in a chair, where he contemplates his fate alone, and breaks down crying. Shortly, Judex leads Jacqueline (Yvette Andréyor) into the room to see her father. When he leaves the room, she reaches out at first towards him as if she cannot bear his departure, but then turns her attention to her father, embracing him. Judex rejoins his brother and mother, Countess de Tremeuse (Yvonne Dario), looking downcast. His mother assures him that Jacqueline now knows the truth, and that she loves him. The Countess now brings Le Petit Jean (Olinda Mano) to Jacqueline and Favraux, and the child seems to break the grandfather from his stupor, as he again accepts his role in the loving family. His expression resumes its blank look when Judex walks into the room and asks for Favraux to pronounce judgment upon him. Favraux asks to see the Countess first. Judex leads Favraux to his mother, and Favraux breaks down and begs her forgiveness. The Countess informs him that he is forgiven, because of the harm that revenge will bring to the innocent Jacqueline and Jean. Meanwhile, the Licorice Kid (René Poyen) has found Robert in the yard and asks to see Cocantin (Marcel Lévesque). Robert takes him to the marina, where Cocantin and Daisy Torp (Juliette Clarens, if my deductions are correct) are returning from their adventures. Cocantin, still wearing Daisy’s hat, introduces her as his fiancée. The Licorice Kid appears to approve of his choice. 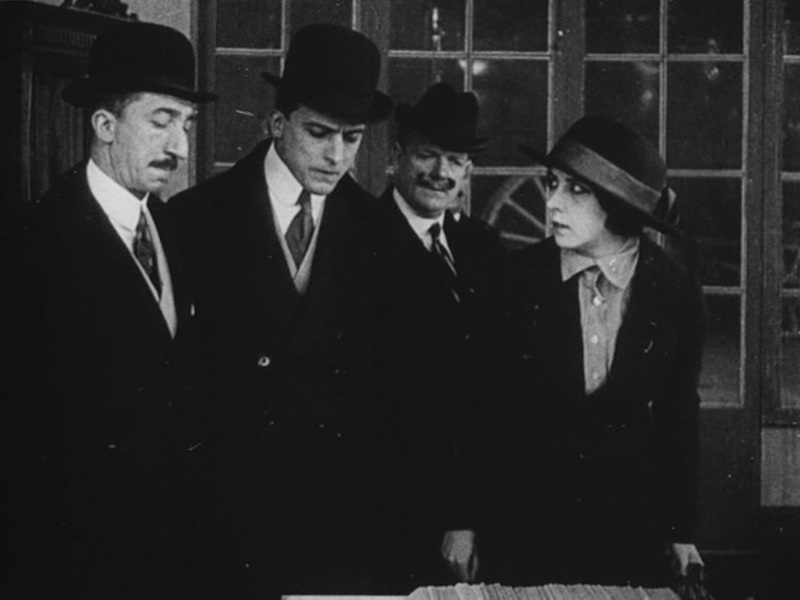 The next day, Kerjean (Gaston Michel) is walking on the seaside when he finds the body of a woman – it is Diana Monti (Musidora), who evidently drowned in her attempt to escape justice the previous night. Michel, who has been deprived of his son by this woman’s machinations, appears to be bitterly satisfied at the discovery. The official “Epilogue” is now announced with an Intertitle, and we see Judex’s now united family, represented by Robert, the Countess, and Le Petit Jean walking in the woods. They find Kerjean sitting sadly at the seaside and Jean runs up to him and kisses him, which brings him out of his reverie. Although he has lost his son, it seems he has a place with the family and can still partake of their love. Favraux, we learn, chooses to live in ongoing isolation without reclaiming his fortune. We see him pruning a tree in his old garden. He interrupts his work when a poor girl comes begging at the gate, and he gives her some money – proving his repentance is sincere, since the series began with him turning away a similar beggar in the Prologue. Next we see Cocantin and Daisy Torp in wedded bliss, with the Licorice Kid as their officially adopted ward. Cocantin proves his love by demonstrating that he is learning to swim on a tabletop. Finally, Judex and Jacqueline are shown in a happy embrace, having overcome everything to be together in one another’s arms. 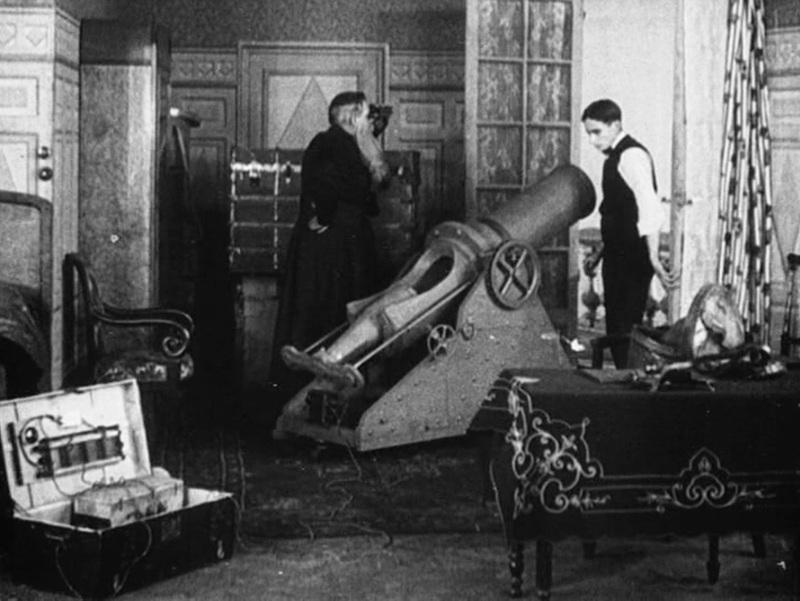 And so ends “Judex,” the third of the crime serials directed by Louis Feuillade, perhaps France’s most important director of the late Nickelodeon period. I’ve seen all three now, and, due to the nature of this project, I wound up seeing them in the sequential order of their release: first “Fantômas,” then “Les Vampires,” and finally “Judex.” During that time I’ve discovered that each one has its fans and devotees, and that there isn’t agreement on which is the “best” of the three serials. I usually try to avoid reducing my reviews to simple analyses of whether I like a film or not, but I have to admit that for me the progression has been pretty much downward. “Fantômas” remains my favorite, then “Les Vampires,” and “Judex” is at the bottom of the list. This despite the fact that the filmmaking techniques, and especially the editing, decidedly improved over time. I have a theory that which one will be your favorite depends on which one you see first. They’re each so different that if you go into the second and third ones expecting more of what you got in the first, you’re bound to be disappointed. That’s a compliment to Feuillade, really, a reflection of the breadth of his skill and imagination. He did not simply make three serials that were all the same, he made three very distinct cinematic experiences, linking them only in terms of cast and themes. And, just because “Judex” seems to me the least of the three Feuillade serials, doesn’t mean I haven’t enjoyed watching it. It’s easily one of the best serials of the period, even if it isn’t “Fantômas.” (I have yet to meet a silent fan who regards “The Perils of Pauline” with the devotion so many give to these movies. “Judex” was made in part as a response to criticism that Feuillade’s earlier crime films had glamorized criminals and de-emphasized the heroes. I think that’s part of why it seems less modern and interesting to me. I think Feuillade tries so hard to emphasize redemption and love that he forgets to include enough action, and his fascinating villainess winds up being cast off, literally killed off as an afterthought at the end of the series. But, in doing this he also more or less invented the concept of the superhero, an iconic figure that the world would spend the next century exploring and re-examining. That’s an accomplishment worth celebrating. You can watch it for free: here (episode incomplete. I have not found the complete episode for free online. If you do, let me know in the comments). Perhaps appropriate for Mother’s Day, this episode of “Judex” is particularly child-and-family-friendly. Characters that have been peripheral up to now become central, and the hero himself does nothing but sulk, but the serial continues to deliver in terms of bizarre scheming and unexpected rescues. In light of the title, I need to mention that the character I’ve been identifying as “Bout-de-Zan” is actually called “the Licorice Kid” in this story. Bout-de-Zan is actually the most well-known character portrayed by child actor René Poyen, who is called “the Licorice Kid” in Judex. Sorry for any confusion! This is a famous early movie by Edwin S. Porter, released earlier in the same year as “The Great Train Robbery.” It is one of the best-known examples of early editing structure, and gives us an opportunity to discuss the development of cinema beyond the single-shot film to the multi-shot narrative, and how this concept has changed over time. The first shot in this movie is an interesting trick shot, or special effect. A fireman is seen dozing at work, and over his shoulder is an image of his dream. He is dreaming about a woman putting a small child to bed (perhaps his own wife and child). The next shot is a close-up on a street-corner fire alarm. An anonymous hand opens the case and pulls the alarm. Then we cut to an image of the bunks inside the firehouse, with all of the firemen sleeping. They wake up to the alarm, and then leap out of bed, put on boots and trousers, and slide down the pole to the stables below. We see each one mount the pole and disappear in turn. Then we cut to the stable, and watch as each man slides down the pole in the center of the screen, and runs over to mount the wagon he will ride. Once they are all aboard, the ropes before the horses are taken down, and they race across the screen. Next we see the exterior of the firehouse, and watch as each wagon bolts out the doors and runs onto the street. We cut to another street corner, and watch the fire trucks race by, while crowds of spectators gather to watch them. There are two such shots in sequence, and each one allows each wagon to rush by, the second panning to follow them. This pan ends at the burning house, where we see the fire fighters preparing their hoses. Now, the scene cuts to the interior of the house, which looks like the same bedroom in the man’s dream from the opening. Smoke is billowing into the room, and the woman and child sleep on the bed. She gets up and runs to the window, screaming for help, then collapses back on the bed. A fire fighter breaks down the door with his axe and runs in. He tears down the curtains and breaks the window open. A ladder appears at the window, and he picks up the unconscious woman, carrying her to it and climbing out on the ladder. A moment later he (or another fire fighter) reappears on the ladder and runs to pick up the sleeping child, taking her out the same way. Now two fire fighters enter from the ladder, wielding a hose, which they spray liberally around the room. The final shot reproduces this last sequence of events, but does so from outside the house (the same shot as the end of the pan, above). A fire fighter enters the burning house from the first floor at about the same moment as the woman appears in the window above. Others set up the ladder from below, and still more train their hose on the house, spraying water in through the open door and windows. Meanwhile, the first fire fighter carries the woman down the ladder and revives her, then runs back to the ladder to recover the child. Finally, the men with the hose climb the ladder, having put out the fire in other parts of the house. This film s famous for showing Porter’s developing understanding of editing, being a great example of a narrative created by inter-linking shots sequentially. For many years, it was also controversial, because there were two versions – one which followed the sequence I have just described, and another which cross-cut the scenes outside and inside to create a more “modern” style of storytelling. It is pretty well established now that this version is correct: first we see the rescue played out in entirety from inside the house, then we see the entire sequence again from the other perspective. This lines up with audience expectations of the time. People would quite probably have been confused by parallel editing, not being used to seeing shots inter-cut at the time. This gives us a chance to talk a bit about how this whole idea of stitching shots together came about in the first place. The old narrative was that certain “genius” directors like Georges Méliès and Edwin S. Porter “invented” it. Actually, this isn’t really true. As we have seen in this project, for many years a “film” equaled a single shot of relatively fixed length, that played out some kind of story, with a beginning, middle, and end. But often they had related themes, fire fighting being a classic example. So, what various ingenious exhibitors started doing was to create narratives by showing related films in sequence, with their own narration filling in names of characters, etc. So, perhaps you would see “A Morning Alarm” followed by “The Burning of Durland’s Riding Academy” and then “Firemen Rescuing Men and Women” while a narrator told you that this was all footage of the same fire. This is where Porter and Méliès (whose “A Trip to the Moon” was a multi-shot film from the previous year) got the idea to make longer movies out of a series of shots. It also explains why they did not cut within their shots – this would have broken the established logic of narrative at the time. This week’s episode of “Les Vampires” continues the serial’s pattern of capture-and-escape, with the emphasis on the villains this time out. 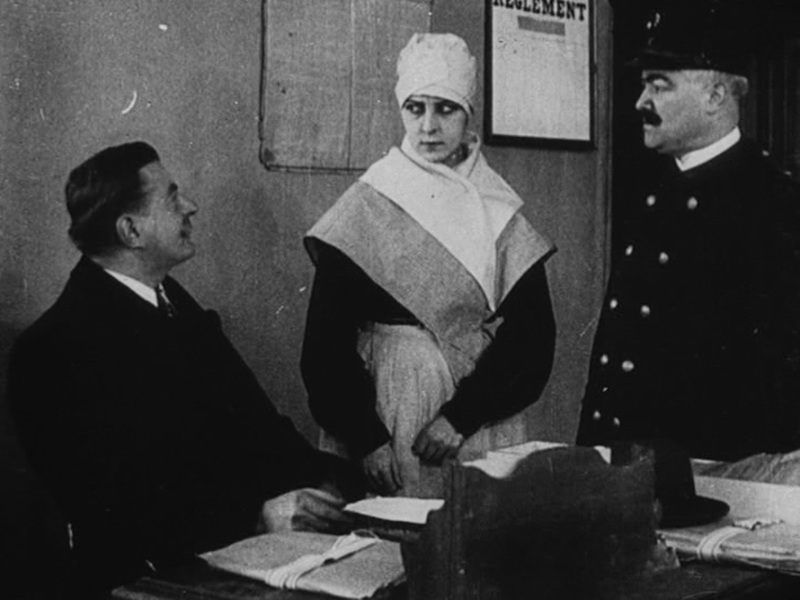 Musidora, as Irma Vep, manages to have a record number of wardrobe changes, and Mazamette (Marcel Lévesque) remembers that he has a family. Irma Vep in her prison uniform. This episode begins where the last one ended – with Moréno and Irma Vep in the custody of police and Satanas (Louis Leubas), the true Grand Master of the Vampires, still at large and unknown to the heroes. Irma is informed that her lover has been executed for his crimes, and that she will be transferred to a prison colony in Algeria for life. Satanas reads this news as well, and disguises himself as a priest, taking a hotel room with a view of the ocean in Montmartre. He then visits the women’s prison, distributing religious literature, but Irma Vep is able to decode a message in her pamphlet that warns her to leap into the ocean, because the boat will be destroyed by an explosion. Satanas then returns to the hotel, where his cohorts have been building one of his handy transportable cannons, and he destroys the ship with a single shell. Irma Vep, in her traveling-to-Algeria getup. Meanwhile, Philippe Guérande has managed to use the codebook he got from the Grand Inquisitor in episode 2 to figure out that the shell must have been fired from Montmartre. Mazamette, who has dropped by to let him and his mother know that he is being considered for the “academic palms,” offers to investigate. 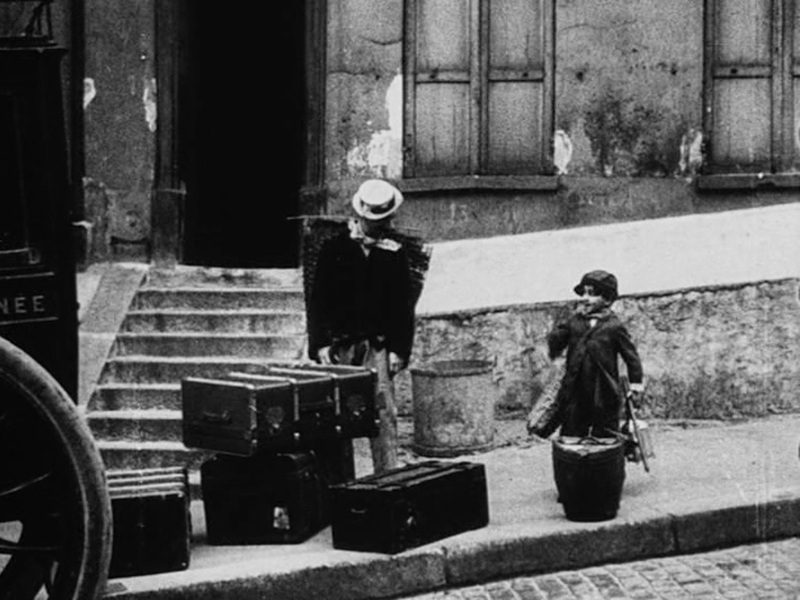 He is unsuccessful on his first day, but then his son Eustache (played by Bout-de-Zan) arrives, having been expelled from school for bad behavior. The two of them dress as garbage pickers and return to Montmartre, where they find a cannon shell being delivered to the Grand Master of the Vampires in a hat box. Satanas stops by Guérande’s house and uses his paralyzing pin to immobilize him while secreting a time bomb in a top hat to blow up the apartment. He sticks a note to Guérande’s collar that proclaims that he has been condemned to avenge the death of Irma Vep. Mazamette arrives in time to see Satanas leaping from the window of the apartment into a waiting getaway car, then is able to find the ticking top hat and dispose of it before it explodes, saving the day. He announces that he now has the address of the Grand Master of the Vampires. Eustache and Mazamette return to Montmartre and attempt to sneak in to Satanas’s home, but Satanas uses a peephole hidden in a mask on the wall to see what they are doing and locks Mazamette into a chest, while threatening Eustache, who pulls out a gun and shoots at Satanas. Satanas acts as if he was hit, but then gets up and grabs the child, when suddenly thee police break down the door and apprehend him. 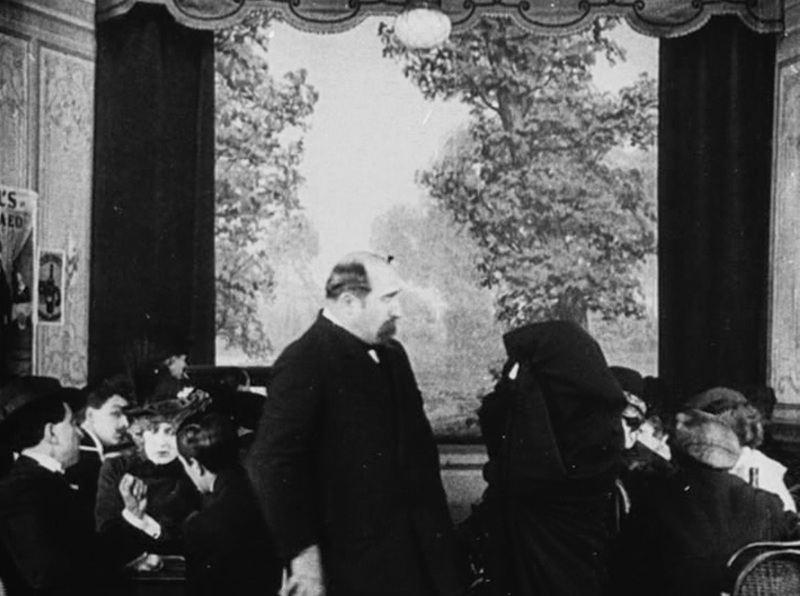 Mazamette is rescued from the chest, but his face is covered with blood – somehow Eustache’s bullet hit him in the nose! Meanwhile, Irma Vep has escaped from the shell after all, and turns up at a railroad station, fainting from hunger and weakness. The railyard workers help her to recover and take up a collection for her, charmed by a phony story of a romantic tragedy that she makes up. She then heads back to the nightclub we saw in episode three, and announces her survival by performing on the stage – the assembled Vampires all recognize her voice. She is taken to the hideout in victory and a couple perform an Apache Dance in her honor. Then, the news of Satanas’s arrest comes, and Venomous (Fredrik Moriss), a “brilliant but deranged chemist” announces that he has been deputized to lead the gang in such a circumstance. They mail a seemingly innocuous letter to Satanas, which Satanas eats to commit suicide. Irma Vep, in her “riding-the-rails” outfit. We’re certainly going through the villains quickly in this serial! Only Irma Vep seems to survive, while the male leaders of the gang fall like flies. I found Satanas to be at least as dull of a villain as the old Master Vampire was, though, so no great loss here. I have some hope for the “deranged chemist,” Venomous, for these final chapters. 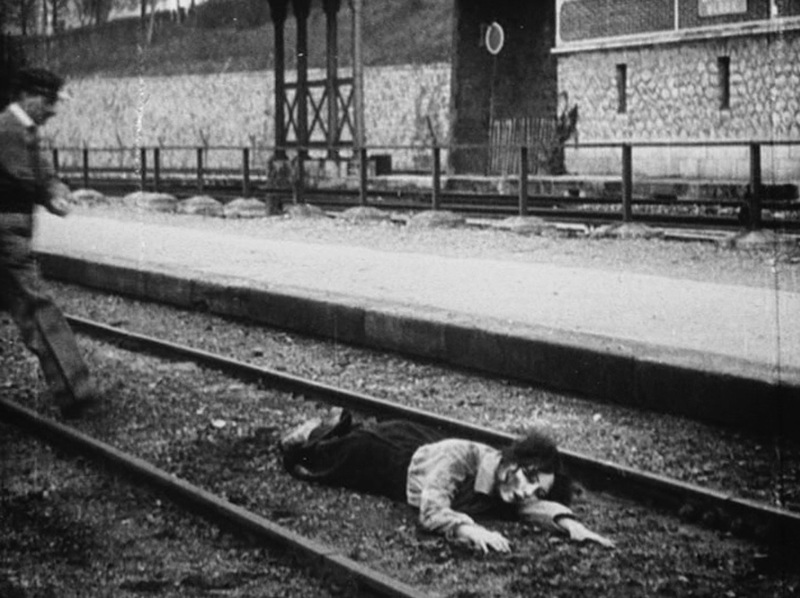 The scene where Irma Vep arrived at the train station was somewhat shocking to me – because Louis Feuillade had Musidora lie on the tracks while an actual train passed overhead! A very dangerous stunt, luckily she was thin enough to pull it off without injury. The arrival of Bout-de-Zan was quite a thrill as well, although he didn’t have all that much to do in this episode, besides shooting his father in the nose, and we didn’t get much of a sense of the playful troublemaking that made him a huge star. Also, the shots of the ship blowing up appeared to be taken from actual footage of naval warfare, suggesting that this was one of the first movies to cut stock footage into its storyline. Irma Vep’s not even sure where these clothes came from. And, now, let’s pause to consider the logic of the story, as always. OK, so assuming that you can transport a cannon in pieces inside of a couple of large trunks, what are the chances you can fire it out a hotel window without getting reported to the authorities? No one complained about the noise? Montmartre must be a pretty raucous place for no one to have minded cannon fire! Also, Mazamette is remarkably fortunate in this episode: not only does he just happen to literally stumble upon a cannon shell being delivered to a particular address, he takes a bullet to the nose that fortunately didn’t go into his brain! Finally, I certainly wouldn’t be eager to advance in a criminal gang with such a high death rate among its leadership. Given the frequency with which they escape from the police as well, it would seem some kind of rescue would be attempted before sending the “poison pen” letter to Satanas.